AFL Clubs are seeking to delist players who no longer fit their teams ongoing game plan. In a popular move, Gary Ablett junior returns to the Geelong Cats from the Gold Coast Suns. Much loved by fans and sport watchers the former Gold Coast Suns captain returns home. He is a local Geelong boy with strong family ties to the area. Thrilled fans can't wait to see him pull on the Geelong Cats distinctive blue and white hoops football jumper, jersey, guernsey. Jake Stringer has been traded from the Western Bulldogs to the Essendon Bombers. An accurate goal kicker and instrumental part of the Western Bulldogs 2016 Grand Final Victory Stringer has played his last game for the Bulldogs. Returning early from an end of 2017 season trip with ex fellow doggies teammates Stringer sporting a new stomach tattoo has commenced training with the Essendon Bombers. Swapping his Western Bulldogs football jumper, jersey, guernsey is only part of the small transition Stringer will make in swapping from a Dog to a Bomber. Plagued with on and off field controversy Stringer will be hoping for success at Essendon Football Club. AFL team the Adelaide Crows are regrouping and rebuilding after their morale destroying loss against the strong Richmond Tigers in the 2017 AFL Grand Final. Rumour and speculation in the media indicates that Jake Lever wishes to return to Melbourne and Charlie Cameron to Brisbane. It is usual for changes to occur within all AFL clubs at the end of the AFL Season. The Crows changes may be fuelled by the experience of loss, and change is particularly prevalent within a Club after a Grand Final loss. Faithful fans, whilst disappointed by the loss will remain loyal to their club. 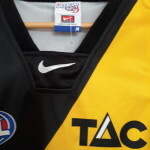 Fans across the country will continue to wear their football jumpers, jerseys, guernseys. AFL Football team Richmond Tigers are jubilant after winning the 2017 Premiership. Capping off a massive week of achievements the Tigers won the 2017 Premiership flag. Tigers player Dustin Martin, won the Norm Smith medal for best on ground. Taking the winners dais after the AFL Grand Final, Tigers Coach Damien Hardwick was gracious in victory congratulating their defeated Adelaide Crows opponents. Many had expected a Crows victory but the Tigers, possibly buoyed by Martin's Brownlow win had risen to the challenge and pulled of a miraculous victory for its loyal fans. 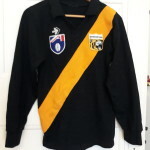 Young Aus Kick footballers,wearing their Tigers football jumpers, jerseys, guernseys, handed the victors their premiership medals with endearing comments to their heroes such as "great game" and "your'e the best" . Partying and celebrations continued all night and into the small hours of the morning around the MCG, next door at the Richmond Oval and across the surrounding suburb of Richmond and neighbouring Cremorne. It is a much feted victory, a long time in the making, as its been thirty seven years since the Tigers last Premiership. A fairytale win, akin to the Western Bulldogs 2016 great victory over the marauding Sydney Swans. A repeating tale of underdog Victorian team wins against much favoured Interstate rival. The crows gallant in defeat will return to Adelaide minus the holy grail, the 2017 Premiership Cup, as this year it remains firmly entrenched in the local Victorian hands. 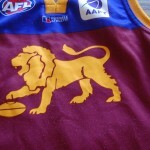 Some fans will put away the much loved football jumper, jersey, guernsey. Others will continue to wear theirs proudly for the weeks and days to come. The MCG was packed to capacity, emotions ran high, and the roar of thrilled spectators went out amidst a vista of yellow and black, or red yellow and blue football jumpers, jerseys, guernseys. It is the pinnacle of the AFL Football Season . 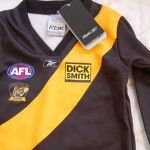 Richmond Tigers fans are spending an anxious week awaiting their beloved teams appearance in the 2017 AFL Football Grand Final on Saturday the 30th of September. It has come down to that last day in September when two battle scarred and weary combatants slog it out for the final glory of taking home the AFL premiership Cup. Geelong put up a valiant fight in Adelaide against the all conquering Adelaide Crows in the preliminary final . . The staunch Cats fought the mighty Crows in front of an Adelaide home town crowd but succumbed to the strength and pressure of the conquering Crows. Richmond annihilated Greater Western Sydney at the MCG in the Saturday afternoon preliminary final. 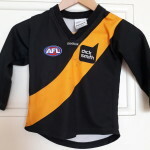 Tigers fans let the roar go during most of the match many wearing their AFL Football jumpers, jerseys, guernseys. Footscray aka as the Western Bulldogs secured a Grand Final win against all the odds in season 2016 beating the Sydney Swans breaking a 62 year drought. Now its Richmond's turn. Can they pull off the fairytale win after a 37 year drought between flags and a 35 year wait for a Grand Final appearance for the much loved local Victorian team. Passions are running high. 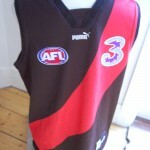 There has already been dispute over home town guernsey strips. 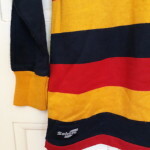 So there is no clash between the yellow strip on both teams jumpers the Crows wear their home strip and Richmond their away or clash football jumper , jersey , guernsey . 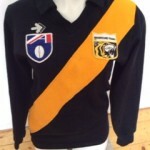 For Richmond this means a yellow jumper with black sash which has made many Tigers fans irate. 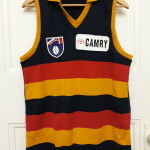 As founding members of the AFL Competition many believe they should wear their traditional strip and the Crows their away one. 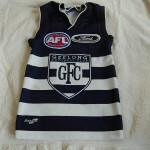 Football Jumpers, Jerseys, Guernseys evoke passion, loyalty and love. 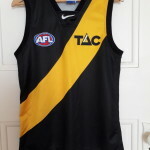 Being stripped of their preferred jumper in this Saturday's big game may be just enough incentive for the tigers to push themselves across the line at the final siren and bring a much lauded victory home for their supporters. and getting along to the game, a bbq, their local pub or friends house to watch a much anticipated game.